A winery tour and tasting for two or four people including handmade truffles. 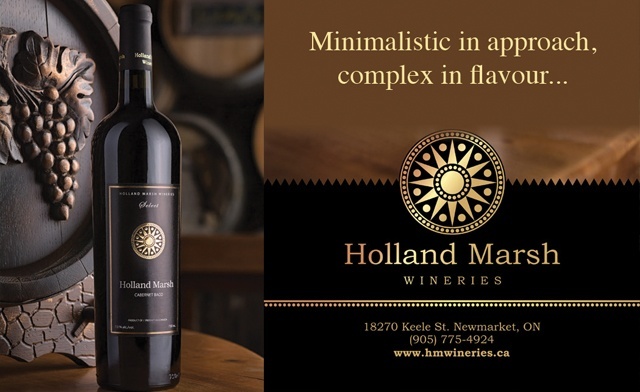 Holland Marsh Wineries 18270 Keele St.
Savour six vino samples with a side of wine-infused handmade chocolate truffles during a tour of the beautiful Holland Marsh Wineries. Tours give guests a taste of their 22-acre vineyard and winemaking facility featuring flagstone paths, an outdoor stone fireplace, gazebo seating and an expansive wine cellar. Lush vineyards frame this picturesque winery that's focused on eco-friendly, European-style wine made with grapes grown in the unique marsh soil that produces a distinct flavour unlike any other in Ontario. Aside from offering tastings and tours of their grounds, Holland Marsh Wineries is a picturesque venue with facilities for weddings, birthday parties, business events, anniversary parties, or any other special event.